Merry Christmas to me. working two jobs I have found it difficult to ride as much as I like. I decided it was time to buy a bike trainer. Quick trip to see my buddy Greg at Class Cycles in Southbury, Connecticut and I had a Wahoo KICKR SNAP in my possession. The Wahoo KICKR SNAP brings a realistic ride experience indoors and into a wheel-on smart trainer. The SNAP’s legendary flywheel features technology that creates the same resistance experienced in outdoor climbs and descents. Plus, no other indoor bike trainer has more software training options, including Zwift and Trainer Road. Join the Wahoo Fitness family and become a part of the most connected cycling experience – both indoors and outdoors. 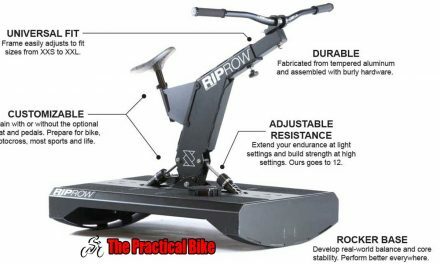 Now you can get all the benefits of the original KICKR, the resistance trainer the pros use, in a wheel-on design that easily turns your road or mountain bike into a powerful Smart Trainer. 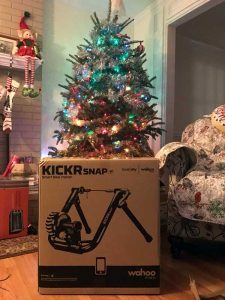 The Wahoo Fitness KICKR SNAP Smart Trainer is constructed with high-strength carbon steel, uses a wide stance to increase stability and locks your bike confidently in position. You’ll get to experience a realistic road feel, accurate and real power measurement — not virtual or estimated power like some trainers, controlled electromagnetic resistance, open 3rd party software options and the smoothest indoor riding on the market. 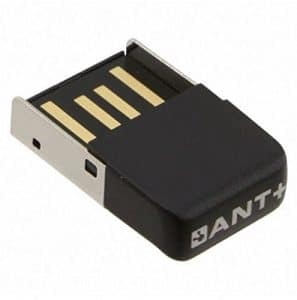 ANT+ and BLE capabilities allow the KICKR SNAP to wirelessly connect with your iPhone, iPad, iPod, Mac Book Pro or Android device, so you can control resistance levels, structure interval workouts, and simulate real-world courses using your favorite Apps. The KICKR SNAP measures speed, distance and power while its high inertia flywheel replicates the feel of an actual rider on the road, plus it runs extremely quiet. Wheel-on design allows for easy-on, easy-off convenience and comfort on longer rides. Get faster, track your progress and have fun on the Wahoo Fitness KICKR SNAP Smart Trainer. 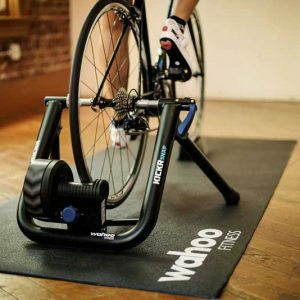 The Wahoo KICKR Trainer FloorMat is the perfect partner for your KICKR. It’s water resistant and anti-slip to keep the trainer in place no matter how much you sweat! The thickness and material make it noise insulating, so your family will thank you during those early morning rides. The Wahoo KICKR Trainer FloorMat also helps keep the bike trainer in place ad protects the flooring. PreviousSchrader Valves vs Presta Valves | Whats the Difference?